Convenient and user-friendly, this one-volume guide provides resources for the entire three-year lectionary cycle, including midweek festival days. Brief comments on each of the three daily biblical texts identify themes for the day, musical settings for the appointed psalm are offered, organ music appropriate for the day is suggested, anthems for the day are graded according to difficulty, and hymns of the day are keyed to several hymnals. 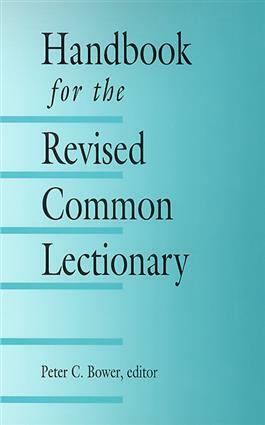 Pastors, music leaders, and worship committees will find much practical assistance for worship planning in the Handbook for the Revised Common Lectionary. As an added bonus, this newly revised guide now includes suggestions from the new Presbyterian Hymnal and The Psalter: Psalms and Canticles for Singing. Walter Brueggemann, Charles B. Cousar, Beverly Roberts Gaventa, James D. Newsome, Jr.
Charles B. Cousar, Beverly Roberts Gaventa, J. Clinton McCann, James D. Newsome, Jr.